Uncontrolled pain is one of the most feared consequences of cancer or its treatment. Therefore, meticulous pain management is essential for the quality of life of many people living with cancer. Integrative pain management techniques can improve pain control while minimizing unwanted side effects. Pain is “an unpleasant sensory and emotional experience associated with actual or potential tissue damage, or described in terms of such damage.” A pain’s sensory and emotional components are not easily separated and its subjectivity makes it inherently difficult to measure and research. WHY BE PROACTIVE REGARDING CANCER PAIN MANAGEMENT? Most physicians are not trained in pain management. Although the State of California passed a bill in 1997 requiring all physicians to have a minimum of 12 hours of pain management education, it is not due to go into full effect until 2007. As a group, oncologists are more pain-management savvy compared to their peers in other subspecialties. Nevertheless, in my experience they may know little about complementary and alternative techniques that show evidence of effectiveness in the medical literature. They also may delay seeking more aggressive pain-management techniques when the usual pain medications and combinations do not work well. Armed with a basic understanding of pain management concepts, patients with cancer will be better equipped to take advantage of the many pain-relieving modalities currently available. » The Cancer Itself. As a cancer grows, it can press on structures that cause pain. there can be pain after radiation therapy. Surgery, such as that done to remove all the lymph nodes in the armpit, can also cause pain and swelling. » Coincidental Pain. This type of pain has nothing to do with the cancer and its treatment. A good example is a pre-existing low back or arthritis pain. HOW DO YOU MEASURE PAIN? Pain is a subjective sensation that cannot be measured by a blood test or scan. It is so closely intertwined with nausea, breathlessness, depression, fatigue, and anxiety that it is difficult to separate them. Most health practitioners use a patient-reported 10-point scale to document their patient’s pain and their response to treatments. A zero on this scale means no pain and a 10 is the worst pain imaginable. Generally, pain from 1 to 3 is considered mild, from 4 to 6 is considered moderate, and 7 or above is considered severe. 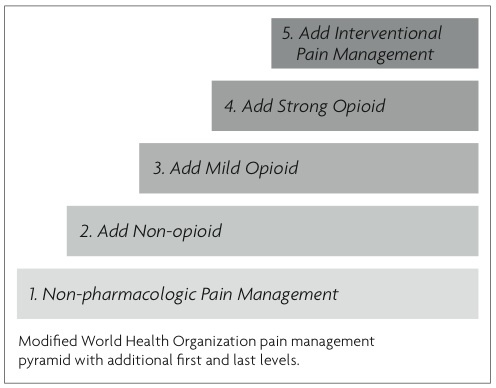 The goal of a pain management program is to get the pain down to a 3 or less on this 10-point scale. Generally speaking, one can divide pain into five types: myofascial pain, which primarily originates in muscles; bone pain; visceral pain, which comes from internal body organs such as the lungs, liver, and bowel; neuropathic pain, which results from malfunctioning nerves; skin and scar pain; and psychological pain. Many times, pain has more than one cause. For example, myofascial pain is sustained and even worsened by psychological stress that tenses up the muscles. that someone’s pain is psychological because the X-rays and scans are normal. Neuropathic pain may also not show up on medical tests, such as nerve conduction studies. Neuropathic pain is by far the most painful of any type of pain condition as its malfunctioning pain nerves erroneously send strong pain signals to the brain. This type of pain usually requires several different pain treatment modalities for relief. Cancer can cause any and all of the above types of pain. HOW CAN YOU TELL WHAT TYPE OF PAIN IS OCCURRING? Often, just taking a thorough history and physical examination is enough to find the source of the pain. For cancer pain specifically, X-rays, CT, MRI, PET, and bone scans may also be helpful. Occasionally, a clear diagnosis of the pain source is needed but not evident from the above tests. For conditions such as myofascial pain and neuropathic pain, diagnostic blocks may be in order. A diagnostic block consists of an injection of local anesthetic (e.g. into a muscle trigger point or around a nerve); if the injection relieves the pain, then the pain source has been located. HOW IS CANCER PAIN BEST TREATED? I first became interested in the integrative treatment of pain – using the tools available to both Western and complementary/alternative health practitioners – about 15 years ago when I learned of acupuncture clinical studies that showed an intriguing ability to relieve pain without the adverse effects associated with most pain mediations. Since then, I have found that using complementary and alternative (non-pharmacologic) techniques in concert with Western (pharmacologic) approaches consistently results in better pain control with lower adverse effects. » If you make one intervention that decreases your pain by 10%, you have not affected your pain control very much. » If you make ten interventions that each decrease your pain by 10%, you are much closer to 100% pain control. » Therefore, if an intervention has very low side effects, does not interact with other medications or supplements, and has about 10% activity, consider adding it to your pain management program. In other words, many low or no-toxicity modalities will make for a more successful pain management program than relying on just one or two. Many readers will be familiar with the acupuncture and herbs that are most often associated with Traditional Chinese Medicine (TCM). TCM has a several thousand-year history of study and practice. In the past decade, the interest in TCM by Western medicine practitioners has surged. A recent search of the Western medical literature on studies including the words “acupuncture” and “pain” revealed over 2,500 articles. Craniosacral osteopathy, a hands-on technique involving gentle manipulation of the bones of the skull, and chiropractice can be very useful for musculoskeletal pain. The manipulation and ergonomic counseling that forms the basis of this modality are highly beneficial. In addition, craniosacral osteopaths who are also proficient in visceral osteopathy can be helpful for those with visceral pain. clinical trials, there is some anecdotal evidence of efficacy7 and I believe this technique shows much promise. Yoga and Qi Gong are examples of movement therapies that have long been known to promote pain relief in people with benign health conditions.10, 11, 12 By extension, it makes sense that these modalities would also benefit those with cancer pain. Indeed, my clinical experience has borne this out. Although not yet extensively studied, Pilates, Feldenkrais, and Alexander movement therapies have been effective in many of my cancer patients. Modalities under this rubric include meditation, guided imagery, hypnosis, and biofeedback. Its scientific evidence of effectiveness is so strong that many Western cancer centers now routinely offer these modalities to their patients.13, 14 No pain management plan is complete without including at least one modality that incorporates the relaxation response. Most Western medical scientists have not studied diet and dietary supplements in the context of cancer pain, but it makes sense that any diet that minimizes the body’s propensity to produce inflammatory proteins would be useful. Interestingly, current medical literature finds that many of the processes that promote inflammation also promote carcinogenesis. An excellent publication by Dr. Jeanne Wallace helps to elucidate the place of anti-inflammatory supplements in the protocols of people with cancer.15 She presents data supporting the idea that supplements such as omega-3 fatty acids (fish oil), curcumin, boswellia, and many others have a definite place in an anti-inflammatory, anti-cancer diet. When formulating a nutritional approach to cancer and its pain, one must be very careful in selecting supplements that are high quality and lack deleterious interactions with prescribed medications or other supplements. A practitioner of traditional Chinese medicine, naturopath, or integrative medicine physician can be invaluable in helping one to devise such a regimen. These are appropriate for mild-to-moderate pain that does not respond to non-pharmacologic treatments. Anti-inflammatory medications such as Advil, Motrin, and Naprosyn are most commonly used. These are especially useful for pain caused by cancer involving the bones. Their major side effect is inflammation of the stomach (gastritis as well as bleeding and nonbleeding ulcers), which can be minimized by taking antacids and other agents such as sucralfate and misoprostol (Cytotec). Those taking blood-thinners or those with bleeding disorders or kidney or liver problems need to take special care when taking anti-inflammatories. risk (family history, high blood pressure or cholesterol, or diabetes) must be especially careful. Acetaminophen (Tylenol) is also included in this group. It neither causes stomach upset nor does it interact with blood-thinners. However, it can be toxic to the liver and kidneys when taken for extended periods or at doses higher than recommended. Drugs such as prednisone, hydrocortisone (Cortef), methylprednisolone (Medrol), and dexamethasone (Decadron) are commonly prescribed in this group. They are especially useful for pain caused by inflammation and bone metastases. Their main disadvantage is a long list of serious side effects that potentially occur in those who take them at higher doses for prolonged periods. These adverse effects include infections, fluid retention, suppression of the adrenal gland, osteoporosis and bone fractures, stomach upset and ulcers, diabetes, and steroid-induced psychosis. serotonin reuptake inhibitors) antidepressants. Tricyclics can cause drowsiness, dry mouth, fast heart rate, sexual dysfunction, and urinary retention. They should be used carefully in those with heart conditions. SSRIs can cause nausea, insomnia, sexual dysfunction, and anxiety. » Anti-convulsants. These medications are particularly useful for those people who suffer neuropathic pain; it makes sense that a drug that calms down “brain nerves” so as to avoid seizures will also calm down pain nerves. Gabapentin (Neurontin) and topiramate (Topamax) are good examples and common side effects include drowsiness and dizziness. » Muscle Relaxants & Anxiolytics. Baclofen (Lioresal), carisoprodol (Soma), and cyclobenzaprine (Flexeril) are commonly used muscle relaxants and may cause drowsiness. Anxiolytics are very useful when anxiety maintains or increases a pain problem. They also have muscle relaxant effects. Lorazepam (Ativan), diazepam (Valium), and clonazepam (Klonopin) are examples. They can all cause problems with alertness, physical coordination, and memory. » Bisphosphonates. For cancer patients with bone pain, this group of drugs can provide surprisingly good pain relief. Used most often in prostate and breast cancer patients, these drugs will also build up bones; those at risk for osteoporosis would also benefit from those drugs. They have very few side effects except for the rare case of osteonecrosis of the jaw, a condition where a portion the jawbone will break down. (found in Percocet and Oxycontin) are very good opioids for moderate to severe pain. 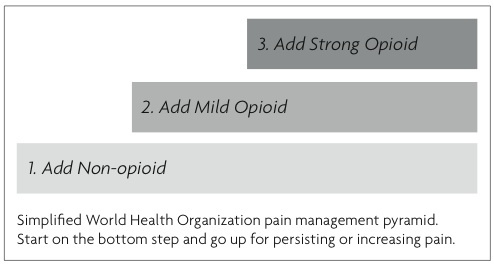 Severe pain is best managed by combining different types of opioids. First, a long-acting opioid (MS Contin, Oxycontin, methadone) is taken around the clock. If pain “breaks through” the long-acting opioid, a short-acting opioid (Roxanol, oxycodone, hydromorphone) is taken as needed. with periods of too much (drowsiness, nausea). No matter what kind of opioid medication one is taking, a proactive bowel program is in order to prevent constipation, the most common opioid side effect. Other side effects include drowsiness, nausea, lack of appetite and, at high doses, muscle twitching. Moderate to severe pain sometimes does not respond adequately to the combination of non-pharmacologic interventions, opioids, and adjuvant medications or, occasionally, the prescribed medications cause severe side effects. In these cases, interventional pain management is in order. Although these techniques are great for pain control, the potential for complications is also greater, which is why they are not used in patients with milder pain. Anesthesia techniques, such as permanent nerve blocks, and spinal cord stimulation can be very useful. Surgical techniques also have a place, particularly in the case of cancer involvement in the spine where one can restore the integrity of a collapsed vertebra (vertebroplasty). Radiation therapy can treat cancers localized to a single bone. Finally, radiopharmaceuticals (intravenous forms of low-dose radiation that hones in on bone) such as strontium-89 (Metastron) and samarium (Quadramet) can treat bone pain caused by bone metastases to more than one bone. Of note, CyberKnife, a state-of-the-art radiation therapy technique, can be useful for painful bone metastases in the spinal area that are not amenable to standard surgical approaches. When pain is caused by an expanding tumor, then therapies that shrink or eradicate the tumor are appropriate. Such therapies include chemotherapy, radiation, and surgery as indicated. Integrative pain management provides the best pain relief with the minimum of side effects. Use of multiple non-pharmacologic techniques affords additive and possibly even synergistic effects so that small individual gains in pain relief can be multiplied significantly; they form the foundation of any complete pain management program. Pain medications, when used appropriately, can successfully relieve severe pain not relieved by non-pharmacologic means. In those cases where other interventions are not successful, interventional pain management techniques are indispensable. What Are Common Pain Managment Mistakes? The most common mistake is that long-acting and short-acting opioids are not used in tandem for moderate to severe pain. Relying primarily on short-acting pain medications results in a “pain roller coaster.” Simply adding a long-acting opioid around the clock can result in better pain control while using the same, or even less, pain medication. The next most common mistake is that health professionals do not move quickly enough into interventional pain management when it is needed. I have often seen patients wonder at the delay in referral to pain management specialists when the referral resulted in less pain and increased alertness. 2. European Journal of Surgical Oncology. 1985;11:389–394. 3. J Traditional Chinese Medicine. 1998;18(1):31-38. 4. Integrative Cancer Therapies. Jun 2005;4(2):131-4. 5. J of Clinical Oncology. 2003;21:4120–6. 6. J of Manipulative and Physiological Therapeutics. 2001 Jan; 24(1):52-7. 7. International Journal of Radiation Oncology, Biology and Physics. Sep 2002; 54(1): 23-34. 8. Cancer Control: J of the Moffitt Cancer Center. Jul 2005;12(3):158-64. 9. J of Pain and Symptom Management. Sep 2004;28(3):244-9. 12. Physical Medicine and Rehabilitation Clinics of North America. Nov 2004;15(4):783-98. 14. Supportive Care in Cancer. May 2004;12(5):293-301. 16. Integrative Cancer Therapies. 2002;1(1): 7-37. 17. Friedman, DP et al. J Pain Symptom Manage. Feb 1990;5(1 Suppl):S2-5. This entry was posted on Thursday, September 22nd, 2005 at 12:00 pm. It is filed under Avenues, Becoming Your Own Advocate.